CHICAGO--(BUSINESS WIRE)-- Hyatt Hotels Corporation (NYSE: H) announced the opening of Hyatt Regency Wuhan Optics Valley, which has completed its rebranding. The opening marks the first Hyatt-branded hotel in Hubei Province of central China. The newly rebranded Hyatt Regency Wuhan Optics Valley is a 45-minute drive from Wuhan Tianhe International Airport and within an hour’s drive of three separate rail hubs: the Wuhan High Speed Train Station and the Wuchang and Hankou Railway Stations. 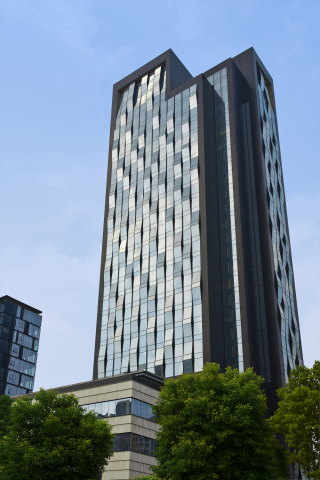 Located in the commercial district of Wuchang and within easy reach of East Lake, Ma’anshan National Forest Park, Huazhong University of Science and Technology and Wuhan Optics Valley, the hotel provides an energizing setting for both business and leisure travelers. Hyatt Regency Wuhan Optics Valley houses 330 guestrooms including 23 suites, each designed to morph effortlessly between office and oasis. The entry-level Deluxe Rooms feature clean-lined, soothing interiors—aided by sliding doors, hidden drawers and unobtrusive storage—punctuated with subtle Chinese references, such as a modern version of a traditional horseshoe armchair. Rooms are equipped with a flat-screen LCD television, a DVD player, a stereo soundbar and complimentary Wi-Fi. Hyatt Regency Wuhan Optics Valley aims to create share-worthy drinking and dining experiences, offering delicious, authentic cuisine crafted from the freshest and finest of local ingredients. Market Café on the ground floor is the hotel’s casual all-day restaurant, offering buffet-style breakfast, lunch and dinner. International cuisine is crafted à la minute at vibrant, live cooking stations, then enjoyed in the main space or al fresco on the outdoor terrace. A Chinese restaurant specializes in contemporary Cantonese and Hubei cuisine with a twist at both lunch and dinner. For more intimate events, there are 10 private dining rooms, including one that seats up to 22 guests. DAMIAMO, the hotel’s Italian specialty restaurant, is named after Via San Damiano—Milan’s famous street lined with luxury fashion stores. Equipped with an open kitchen and a wood-fired oven, DAMIANO serves authentic, contemporary Italian cuisine at dinner, accompanied by premium wines from Italy. The Lobby Lounge boasts a 108-foot-(33-meter) long, wood-topped bar, which is the longest bar in Wuhan. Open all day, the lounge is the perfect rendezvous point, offering champagne and premium wines by the glass and inventive cocktails as well as light regional snacks and refreshments. Hyatt Regency Wuhan Optics Valley features almost 16,000 square feet (1,480 square meters) of meeting and event spaces. The majority of spaces feature natural daylight, and all are equipped with the very latest technology. Spanning 7,965 square feet (740 square meters) and featuring a 25-foot- (7.7-meter) ceiling, the Regency Ballroom on the third floor is an impressive venue for high-profile events and grand weddings. Seven additional event spaces, ranging from 484-2,960 square feet (45–275 square meters), are perfect for business meetings and intimate celebrations. A team of experienced, dedicated chefs and catering specialists are on hand to ensure every event—whether an intimate dinner, formal gala ball, private business meeting or large convention—is planned to precision, expertly orchestrated and flawlessly executed. An array of wellness and recreational facilities are available to guests at Hyatt Regency Wuhan Optics Valley. Those looking for rest and relaxation may opt for the spa, a 29,063-square-foot (2,700-square-meter) facility designed by the award-winning, Singapore-based spa specialists AW Lake Spa Concepts. The spacious sanctuary includes: a Korean-style Akasuri body scrub room; a manicure and pedicure room; a foot massage parlor; sauna and steam rooms; single and double treatment rooms; a hair salon; and a retail shop. A carefully curated menu offers results-driven treatments derived from the best of Eastern and Western therapies, using natural products throughout. Those eager to keep up with their workout schedule will enjoy the 72-foot (22-meter) lap pool. Alternatively, guests may opt for a more rigorous routine at the fitness center, fitted with the latest Technogym fitness equipment. Qualified personal trainers are on hand to help guests achieve guests’ exercise goals. Wuhan is the capital of Hubei province and is the most populous city in central China. With a 3,500-year history and rich cultural heritage, Wuhan is one of the most ancient and civilized metropolitan cities in China, and it is home to many world-class tourism attractions. Arising out of the conglomeration of three cities, Wuchang, Hankou and Hanyang, Wuhan is a major transportation hub, with dozens of railways, roads and expressways passing through the city. Today, Wuhan has also become an important center for economy, trade, finance, transportation, information technology and education in China. The Hyatt Regency brand is an energizing hotel brand that connects travelers to whom and what matters most to them. More than 150 conveniently located Hyatt Regency urban and resort locations in over 30 countries around the world serve as the go-to gathering space for every occasion – from efficient business meetings to memorable family vacations. The brand offers a one-stop experience that puts everything guests need right at their fingertips. Hyatt Regency hotels and resorts offer a full range of services and amenities, including notable culinary experiences; technology-enabled ways to collaborate; the space to work, engage or relax; and expert planners who take care of every detail. For more information, visit hyattregency.com or facebook.com/HyattRegency.